Easily personalized, this beautiful painting will be offered in September for a one-time only class! This classic vineyard scene is fun & easy to create, but seating is limited! Food, Fun, Wine & Laughter! 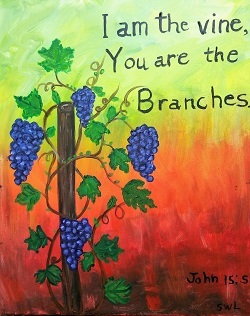 Join us at the vineyard and create your own masterpiece! Art supplies, light refreshments and a glass of your favorite MRV wine included! Guided class, $30.00- Call for tickets, 276.328.2013.